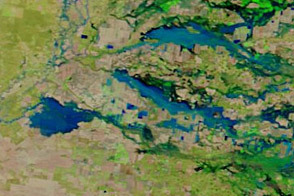 Rising waters flooded parts of New South Wales and Victoria, Australia, in March 2012, forcing some residents to evacuate their homes. On March 15, evacuation orders were lifted for the northern Victoria town of Nathalia, which had faced possible inundation. Although allowed to return home, residents were warned to stay vigilant for rapidly rising waters, news reports said. 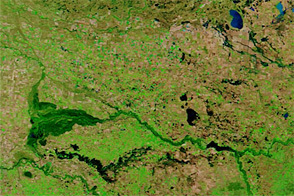 The Moderate Resolution Imaging Spectroradiometer (MODIS) on NASA’s Terra satellite captured the top image on March 12, 2012. 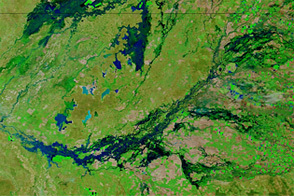 For comparison, the bottom image shows the same region on February 25, 2012. 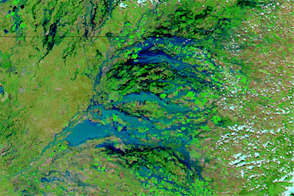 These images use a combination of visible and infrared light to better distinguish between water and land. Water varies from electric blue to navy, with darker shades generally indicating deeper water. Vegetation is bright green. Bare ground is earth-toned. Clouds range in color from white to pale blue-green. 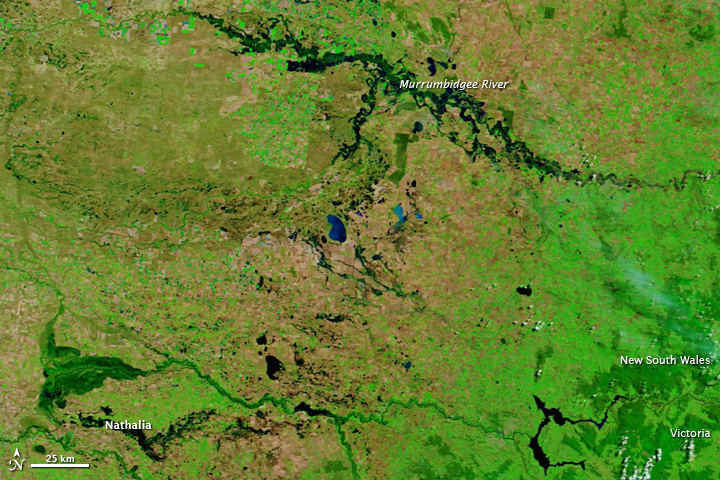 In late February, most of the area pictured in these scenes was relatively dry, with little standing water. By mid-March, the situation had changed significantly. 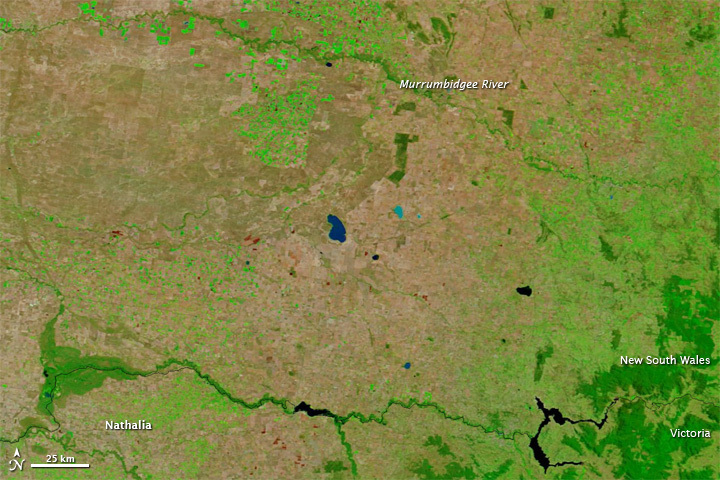 High water not only surrounded Nathalia in Victoria, but also swelled the Murrumbidgee River in New South Wales. 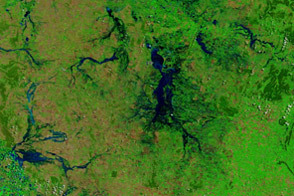 The widespread flooding followed a prolonged regional drought, known as Big Dry, lasting from 1997 to 2011. 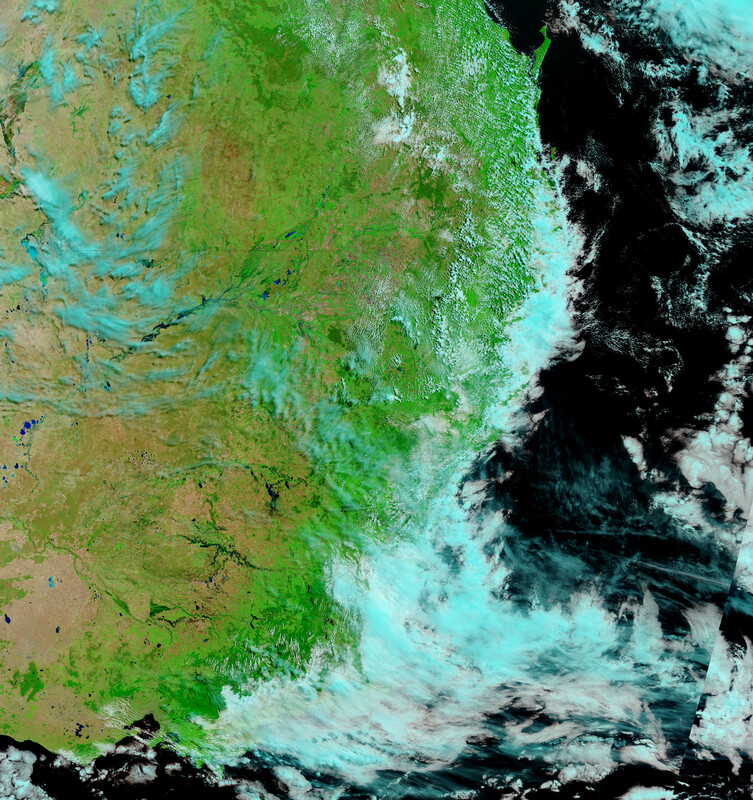 Acquired in late February and mid-March 2012, this image pair shows rising flood waters in southeastern Australia. 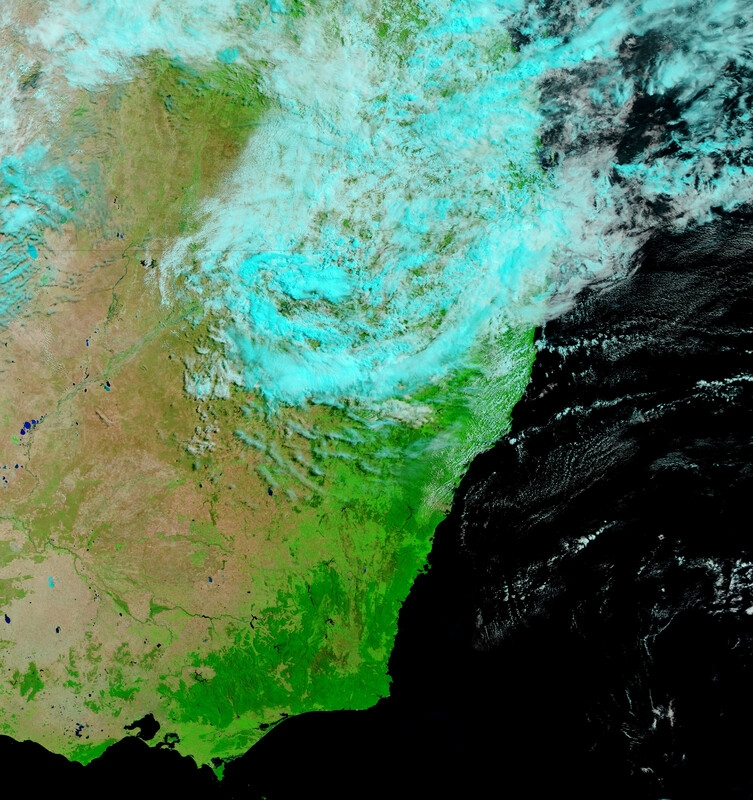 Severe flooding affected multiple communities in southeastern Australia in February and March 2012. Australian Associated Press. (2012, March 15). Residents returning to flooded Nathalia. NineMSN.com.au. Accessed March 16, 2012.